For centuries the extremely tolerant climate in Holland has had a magnetic appeal to gay men all over the world. After all, where in the world can a gay couple walk hand in hand or smoke a joint in the streets without repercussions? 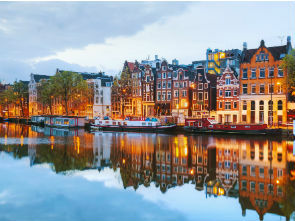 The gay scene is well represented in this former seventeenth century harbour city with it picturesque canals and bridges, that give it its unique place in world architecture. The four most important gay areas are situated in the centre, within walking distance from each other: the Reguliersdwarsstraat (trendy), the Amstel ("Bruin Cafe"-authentic dutch pub), the Warmoesstraat (leather) and the Kerkstraat. Amsterdam hosts a number of large gay events every year. There are several street parties on King's Day which took place for the very first time since Queen Beatrix abdicated in favour of her son, Willem Alexander, in 2013, and the Roze Wester Festival at the Homomonument next to the Westerkerk. Every first weekend of August the Amsterdam Pride takes place. The Canal Parade on Saturday forms the highlight of the festivities and is the only gay-parade on water in the world.